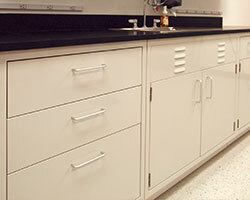 Eclipse Steel Casework is the foundation of any laboratory's workspace. There are configurations and sizes for all storage and function requirements. Casework is available in both counter/ADA and desk heights, with removable back panels and adjustable floor glides. Eclipse Wall Mounted Cabinets are available in a wide range of sizes to provide all the extra storage capacity your lab requires. Hinged, sliding or open cabinets are all choices. 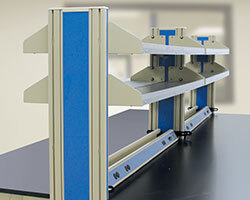 Eclipse RA Racks/Shelving provide arm's reach storage space for frequently used items and storage needs. They feature smooth and strong extruded aluminum uprights that provide infinite vertical adjustability for shelving and utility components. The Eclipse series of laboratory grade steel furniture provides the structure and foundation to easily and systematically furnish any modern lab. Eclipse brings the versatility, ease of future expansion and reconfiguration, storage, mobility, strength and stability for all types of laboratories; with full accessibility to mechanical, plumbing and electrical components. Our decades of experience contribute to making Eclipse the most adaptable, functional, durable and easiest to deploy steel furnishing available for labs today. Eclipse casework is manufactured using heavy gauge, cold rolled steel, with fully welded seams. Top to bottom, the design is reinforced to maintain rigid structural integrity and long term durability. Each cabinet is finished with electro-statically applied powder coat paint. 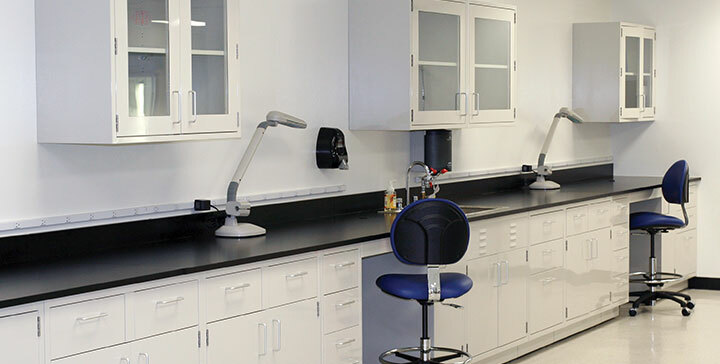 The Eclipse line offers countertop solutions, service fixtures, fillers, reagent racks and shelving, faucets and sinks, and electrical/data connections, seating and many other necessary laboratory accessories. 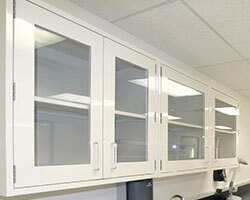 This includes the IAC Industries network of resources to help complete the full spectrum of your laboratory needs; including necessities such as fume hoods, peg boards and other various lab equipment elements. Whether you are building a new laboratory, renovating or upgrading an existing lab, the Eclipse Series of laboratory grade steel furnishing will fulfill your application needs. In addition to the standard Eclipse products is our fulfilment of custom requirements that includes adaptable tables and cabinets, modular furnishings, and data connectively, lighting and functionality – fulfilling your application needs is our mission. Food & Bev - R&D and Q.C. Eclipse Catalog is Here Now. IAC's professional design consultants are standing by to help you with your project. We're proud to have worked with a who's who of Fortune 100 and Fortune 500 companies. Here are just a few of our clients.